The Digital Research Library of Illinois History Journal™: The John Bull Locomotive at the 1893 World's Columbian Exposition, Chicago, Illinois. The John Bull Locomotive at the 1893 World's Columbian Exposition, Chicago, Illinois. John Bull is a British-built railroad steam locomotive that operated in the United States. It was operated for the first time on September 15, 1831, and it became the oldest operable steam locomotive in the world when the Smithsonian Institution operated it in 1981. Built by Robert Stephenson and Company, the John Bull was initially purchased by and operated for the Camden and Amboy Railroad, the first railroad in New Jersey, which gave John Bull the number 1 and its first name, "Stevens". (Robert L. Stevens was president of the Camden and Amboy Railroad at the time.). The C&A used the locomotive heavily from 1833 until 1866, when it was removed from active service and placed in storage. 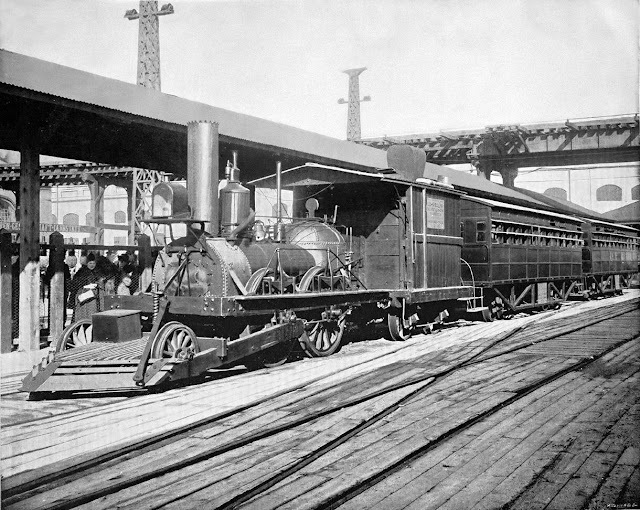 After the C&A's assets were acquired by the Pennsylvania Railroad (PRR) in 1871, the PRR refurbished and operated the locomotive a few times for public displays: it was fired up for the Centennial Exposition in 1876 and again for the National Railway Appliance Exhibition in 1883. In 1884 the locomotive was purchased by the Smithsonian Institution as the museum's first major industrial exhibit. The locomotive's first public exhibition at the Smithsonian occurred on December 22, 1884. The 1893 World's Columbian Exposition, Chicago. The most significant display occurred in 1893 when the locomotive traveled to Chicago for the World's Columbian Exposition. The Pennsylvania Railroad (PRR), like many other railroads of the time, put on grand displays of their progress; the PRR arranged for the locomotive and a couple of coaches to be delivered to the railroad's Jersey City, New Jersey, workshops where it would undergo a partial restoration to operating condition. The PRR was planning an event worthy of the locomotive's significance to American railroad history — the railroad actually planned to operate the locomotive for the entire distance between New Jersey and Chicago. Governors of all the states that the locomotive was to pass through and the President of the United States, Grover Cleveland, were invited to ride behind the engine on its first leg toward Chicago. The John Bull was to pull a few passenger cars in a train that would carry dignitaries and representatives of the press. The train traveled to Philadelphia, Pennsylvania, in the charge of one locomotive crew. From Philadelphia, local train engineers were employed to ride on the locomotive's footplate as pilots to advise the operators for the trip over the local engineers' territories for the rest of the journey to Chicago. Traveling at 25 to 30 miles per hour, the train departed from the Pennsylvania Railroad's Jersey City station at 10:16 a.m. on it's 912 mile journey. On April 17th and reached Chicago on April 22nd. The locomotive operated during the exhibition giving rides to the exhibition's attendees, and then the train left Chicago on December 6th for the return trip to Washington. The locomotive arrived back in Washington on December 13th. Hamilton Daily Democrat article, March 31, 1892. Reading Pennsylvania - A fatal accident occurred on the Frankville branch of the Reading railroad last night. A large engine with a train, which was coming down the steep grade, got beyond the control of the crew, and ran away. After running several miles the locomotive collided with a light engine, wrecking both, derailing a number of cars and instantly killing Joseph Troy, andJohn Baner, breakmen of the light engine. John Bull, another train man, was fatally injured. The engineers and others of the crew escaped by jumping before the crash came. Gromer Super Markets, Streamwood, Illinois. Lost Towns of Illinois - No Man's Land, Illinois. The Chicago Coal Famine of 1903. The History of Chicago's President Street Names. The Founding of Orangeville, Illinois.